The Nokia 9 is the high end version of the new series of Nokia branded smartphones released by licensee HMD. A smidgen more than a week ago, the phone was benchmarked on Geekbench and put up noteworthy scores of 2255 on the single-core test and 7770 on the multi-core test. Today, the handset was discovered on the AnTuTu benchmark site which revealed some specs belonging to the device. 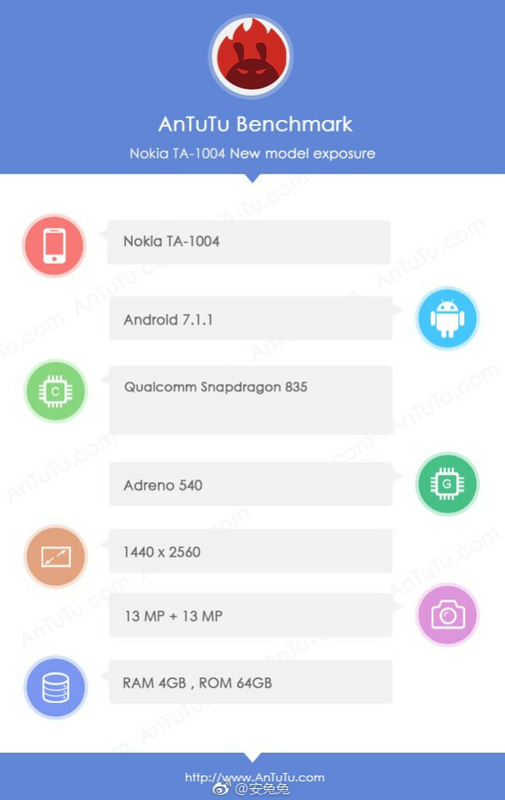 With the model number Nokia TA-1004 (the same model number seen on Geekbench), the Nokia 9 will feature a display carrying a resolution of 1440 x 2560, according to AnTuTu. While the size of the screen was not posted, we expect it to measure 5.3-inches. As expected, AnTuTu says that the Snapdragon 835 chipset, Qualcomm's current high-end SoC, powers the Nokia 9. That means that the phone is equipped with an octa-core CPU and the Adreno 540 GPU. 4GB of RAM is inside along with 64GB of native storage. Both the rear and front-facing cameras weigh in at 13MP, and Android 7.1.1 is pre-installed. We could see the Nokia 9 officially unveiled sometime later this month. Yeah but it's a European designed phone made by the Chinese... it's barely even Nokia any more, so I'm not interested. You know as opposed to the iPhone which is a US designed phone made by the Chinese or the Galaxies which are Korean but made by the Chinese. So I'm going to stick with my legit US iPhone... designed in a country that mostly believes in God, but rejects Climate change, so down to earth people, not those disgusting Climate loving Chinese. It appears he was trying to both make a joke and take a swipe at people who are against phones made in other countries or people who prefer their phones be built in certain countries. But it turned out to be both humorless and confusing to people reading it. @slannmage Are you on crack? That's some next level iSheep tomfoolery. "So I'm going to stick with my legit US iPhone... designed in a country that mostly believes in God, but rejects Climate change, so down to earth people, not those disgusting Climate loving Chinese." how is any of that liberal? I'm starting to think people really don't know the meaning of the word. guys... you really can't recognize sarcasm, do you? You should stop using iPhones. They are also manufactured in China. He said that. You are only repeating what he said. "You know as opposed to the iPhone which is a US designed phone made by the Chinese "
My reply is not showing up below the comment where I made it. I was replying to @Shubham412302 who tried to tell the original posted the iPhone was made in China, when the original poster already said that. Finally some real Sd835 bench numbers. Someone clearly hasn't done their research. Here, let me help you out: http://www.hmdglobal.com/ "HMD is made up of veteran Nokia staff and is headed by CEO Arto Nummela, who previously spent 17 years at Nokia. It is headquartered in Espoo near Helsinki, in front of Nokia's headquarters. Their smartphones are based on the Android operating system, whereas their feature phones use Nokia's legacy Series 30+ platform. Manufacturing and distribution is outsourced to Foxconn's FIH Mobile division. Whilst Nokia itself does not directly invest in HMD, it has a board member representative, sets mandatory requirements, and receives royalty payments for patents." Got that^ from here: https://en.wikipedia.org/wiki/HMD_global?wprov=sfsi1 You're welcome. Eagerly anticipating the release of the Nokia 9! guys... you really can't recognize sarcasm huh? I don't blame them. People don't put much thought on long comments and tend to take it mostly literally. I'm sure it would've been understood by most, if fewer words were written.